NEW YORK - If model thin is always in, at least there were fewer protruding collar bones and ribs to be counted at New York Fashion Week. Models were up to sizes 2 and 4 -- not 0, according to Nian Fish, chair of a fashion designers health initiative. Designers rejected prepubescent 13-year-olds. And at least one super-thin model who had the audience talking a few seasons ago was noticeably absent. "I think a lot of the direction from the designers has been a much healthier approach," said James Aguiar, co-host of Ultra HD's "Full Frontal Fashion," who noticed more curves and smiles on the runway. Avril Graham, executive fashion and beauty editor at Harper's Bazaar, also saw a healthier look and more diversity: "We're obviously going through a season of a less cookie cutter look." That is a small relief to those who have brought attention to the cause of eating disorders in the fashion world, though many say there's a long way to go. "I saw a few that looked better," said Finola Hughes, host of "How Do I Look?" on the Style Network. "I actually saw some breasts, which was great. But there was one show I went to and everyone looked really skinny." The question of how thin is too thin has been tossed around since Kate Moss made her modeling debut 20 years ago, ushering in an era of "heroin chic." In 2006, at least two models died from complications linked to eating disorders, which prompted some in Europe to try to ban skinny models from the runway. Efforts were more modest in the United States. 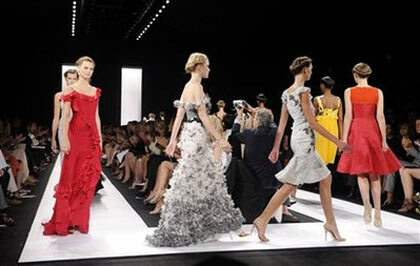 The Council of Fashion Designers of America held workshops on eating disorders and recommended that designers keep models under 16 off the runway, offer healthier snacks backstage and require those identified as having an eating disorder to seek professional help if they want to continue modeling. "I think there's progress," said Fish, creative consultant for KCD Worldwide, which produces fashion shows and events. "The girls are still slim. We didn't want them not to be slim. We wanted a projection of health." Some critics consider the industry's efforts lacking because they still let skinny winnies rule the runways — while the models suffer to become walking hangers. As a new model at 15, Coco Rocha said she went to Singapore and lost 10 pounds in six weeks. When she returned to the U.S. she was so obsessed with food, she beat herself up over eating an apple. "I'll never forget the piece of advice I got from people in the industry when they saw my new body," she wrote in an e-mail to The Associated Press. "They said, 'You need to lose more weight. The look this year is anorexia. We don't want you to be anorexic but that's what we want you to look like.'" Rocha is one of the few models to speak out about the issue, even as ultra-thin models find their way into pro-anorexia "Thinspiration" videos. The question isn't just about model health; it's about who will win the hearts and minds of the teenagers and young girls who look up to them. Young girls can now see more realistic shapes on television, from the Dove Campaign for Real Beauty to the plus-size winner on "America's Next Top Model." And models have largely disappeared from the covers of magazines, replaced by celebrities who generate their own is-she-too-thin headlines. But that doesn't mean models aren't influencing girls and women. Carol Weston, advice columnist for Girls' Life Magazine, said she gets letters from tween girls who want to models or are looking for weight-loss advice. Modeling "seems so glamorous," she said. She said many teenagers confess that they starve themselves, purge or use diet pills. Eating disorders groups have recommended requiring adult models to have a body mass index of at least 18.5 — the lower limits of a normal weight — and an independent medical certification affirming that they do not suffer from an eating disorder. "They do drug testing for sports. Why? To keep competition clean but hopefully also to save lives. That's what we want, too," said Lynn Grefe, CEO of the National Eating Disorders Association. For now, the goal is simply to raise awareness, said CFDA president Diane von Furstenberg. "I think that it's a good thing to do it the way we're doing it as opposed to throwing those poor girls on a scale and terrifying them even more," she said. Because of the initiative, some models were identified as having an eating disorder, referred for treatment and are back on the runways, Fish said. Some who didn't look healthy weren't used. There has been some pressure for designers to increase their model size to a 6, but the designers prefer models whose modest curves don't compete with the clothes, Fish said. London recently dropped its plan to require medical exams for models because of a lack of international support. "Thin is going to be the ruling look -- until someone says, 'I want voluptuous,'" said Fish. "I don't know if that ever is going to come back."